This is a reprint of a picture taken sometime after the Civil War. 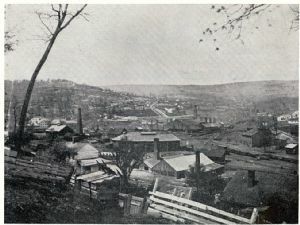 It shows the Rolling Mills in the foreground, and the blast furnace in the far background of the Mount Savage Iron Company where the first railroad rails in America were manufactured in 1841, and onwards. These are the original buildings. Through the courtesy of Rev. George Stanley Schwind.